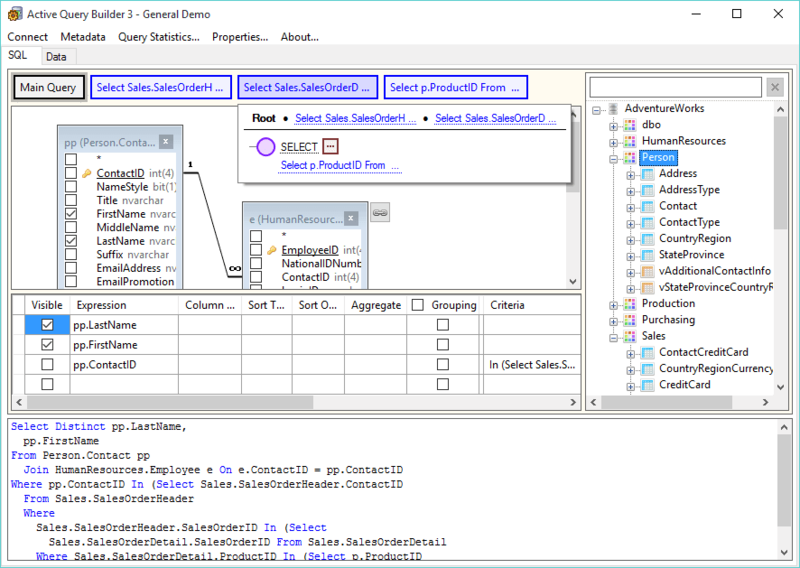 We are glad to introduce the first beta version of Active Query Builder 3 WinForms and WPF Editions! Our primary goal for the third version was to empower the end-user interface for easy SQL query editing. And we targeted the development to port the component to different platforms: Windows Forms, ASP.NET, WPF, Mono, and others. So, we reorganized the component by splitting it into several layers. The small cross-platform core with separated query object model and its logic controller is Core and Mono compatible now. The UI presentation controller allows for quick support of various GUI subsystems and third-party visual libraries. The customers blamed the previous version for lack of UI flexibility. Some of them have requested to move out the Database Schema Tree to a separate visual control; the others have preferred a wizard-like interface. The new version allows for reorganizing existing visual components the way you need. It lets add new controls into it, and new visual controls to ease visual query building are on the way. The free composition of the user interface. Now you can re-arrange the user interface controls the way you need. You can move the Database Schema Tree out, place the Design Area and Query Columns Grid on separate tabs, etc. The new Sub-Query Navigation pane. We've renounced tabs to navigate sub-queries and created the new control for this purpose. It lets visualize, navigate and edit the structure of any complex SQL query. The new sidebar panel will replace the modal property editing dialogues. It will let change various properties of query objects: table aliases, join types and expressions, TOP/LIMIT, DISTINCT clauses with no need for modal dialogues. A lot of minor improvements will be made to simplify routine tasks (reordering of multiple query columns with drag & drop, etc.). Many changes are coming to make programmer's work with SQL queries as easy as it can be. Data type detection of SQL expressions. Migrating from AQB.NET 2 to AQB.NET 3.